Mets prospect Brandon Nimmo will get a taste of playing in New York after he and Astros shortstop Carlos Correa won the All-Star Sunday Futures Finalists ballot, MLB announced Monday. Fans have been voting on MLB.com to send one final player to the U.S. and World rosters for the 2013 All-Star Futures Game, which will be played at the Mets' Citi Field on July 14. Nimmo beat out a group that included Boston's Garin Cecchini, the Yankees' Tyler Austin and the White Sox's Courtney Hawkins. 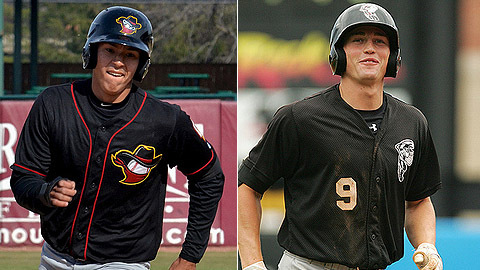 Detroit's Nick Castellanos, the MVP of the 2012 Futures Game, finished second in voting for the American squad. Correa edged Cubs slugger Javier Baez, Rangers second baseman Rougned Odor, unranked Mariners prospect Ji-Man Choi and Oakland No. 2 outfield prospect Renato Nunez. Nimmo, the Mets' top pick in the 2011 Draft, said he's excited to introduce himself to fans he hopes to be playing in front of sooner than later. "I'm just looking forward to getting out to New York and being [at] Citi Field and being around the fans. Hopefully they'll get to see me in person and get to interact with me," Nimmo told MLB.com. "Just being around the fans and [letting them know] what I'm like in first person. They've heard about me, but that's all they do when you're coming up through the Minor Leagues. It'll be nice to let them get to see me, and meet me. I'm just excited to meet the fans that voted me in." Nimmo's average has dipped to .277 after a recent slump with Class A Savannah. He has one homer, 22 RBIs, four steals and a .378 on-base percentage in 52 games for the Sand Gnats. The Wyoming native said he received support from fans after campaigning on Twitter and through local radio stations. "I just did a few things. I got on some radio stations, and I did a little thing where I got on the Mets' Twitter and got control of that to answer some questions for a little while," he said. "So we did a little bit of campaigning. I'm sure not quite as much as some of those [other] guys do to get into the All-Star Game, but it was definitely a new experience for me. It was a lot of fun, and it's something I'll never forget." Correa, the No. 1 overall pick in the 2012 Draft, is batting .323 with five homers, 47 RBIs, seven steals, 15 doubles and a .408 OBP for Class A Quad Cities in his first full season in the Minors. The 18-year-old entered the season ranked by MLB.com as the No. 30 prospect overall and No. 5 shortstop prospect in baseball. Drafted out of the Puerto Rico Baseball Academy as the first player from Puerto Rico to be selected with the No. 1 overall pick, Correa said he owed much of his support to his hometown fans. "The fans went crazy over there. It was all over the news. Everybody was voting over there," Correa told MLB.com. "I heard from my family that everybody would see them in the malls, in the restaurants, wherever they'd see them, and say, 'We're voting for for your son. We're supporting him,' so that's great for my family. It makes them feel like the country really cares about baseball and about me." Correa beat out Baez, who has 17 homers and 57 RBIs for Class A Advanced Daytona, by one percent. "They trust me and what I can do," Correa said of his Puerto Rican fans. "They gave me their support, so I want to be out there and do my best at the game and make the fans proud and happy." The 15th annual Sirius XM All-Star Futures Game takes place at 2 p.m. ET on All-Star Sunday at Citi Field in New York and can be seen live on MLB.com and ESPN2 and followed live on MLB.com's Gameday. In addition, XM Radio will broadcast play-by-play coverage of the event live on MLB Network Radio XM 89. Danny Wild is an editor for MiLB.com. This story was not subject to the approval of the National Association of Professional Baseball Leagues or its clubs.